Australia is a developed and mature economy. In general, its consumption of tissue and tissue products is expected to also be mature. Yet its growing and simultaneously ageing population has expanded its consumption of tissue products over the last decade. of a solid increase in local tissue production, as Figure 1 shows. consumption for the year, with imports holding 38% of the market. inventory movements, which in a small market could account for 8% to 10% of the consumption in any year. Australians are, on the latest data, using an average 13.0 kg of tissue per annum, every year. The growth in per capita consumption over the decade has averaged 2.1% per year, which can be seen in Figure 2, along with Australia’s population. especially because population growth of 1.6% per annum over the decade to 2018 helps to explain why more tissue is being consumed by the country, but does not explain why each person is consuming more. 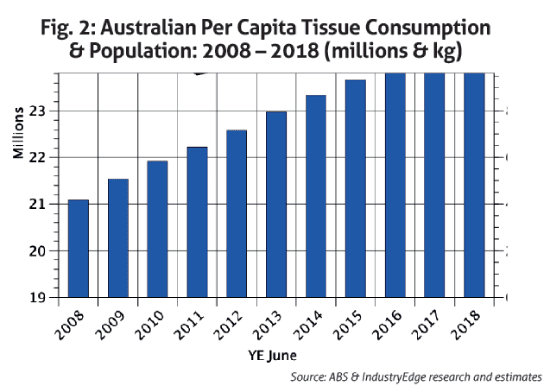 But the nature of the population growth, the ageing of the population, and the way in which Australians live their lives, is driving tissue consumption higher. napkins, serviettes and towel products. As a comparison to the Australian experience, per capita tissue consumption in New Zealand was calculated at 11.5 kg per person for 2017-18. Growth in per capita consumption over the decade has been a more substantial average of 2.5% per annum. 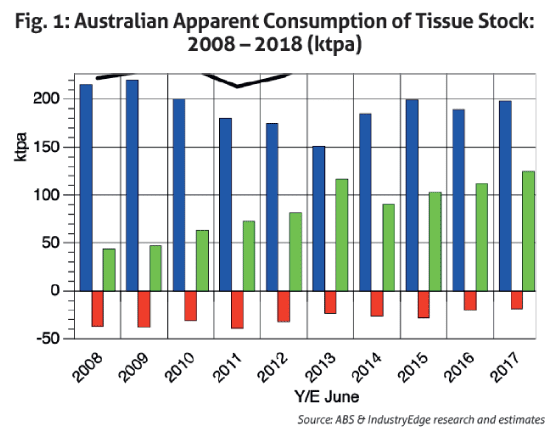 For all that Australian tissue consumption has grown strongly over the decade, production in the last financial year was just short of the decadal high. IndustryEdge assessed production as reaching 217,000 tonnes for the year, but this was below the peak of 220,000 tonnes achieved in 2008-09. Production of tissue in Australia, almost all supplied by imported pulp, is not remarkable in itself, but its growth from the prior year is very strong, as Figure 3 shows. of imports of tissue stock, and pre-converted tissue product imports. Australia’s four tissue producers, the locally owned ABC Tissue and the much smaller Encore Tissue, the Australian Stock Exchange listed Asaleo Care in which Essity retains a significant share and the global giant Kimberly-Clark, have a combined capacity we estimate to be 256,000 tonnes per annum. has been introduced to the Australian tissue market. deliver on the final instalment of its announced expansion plans at or around these levels. It commenced a program of investment in late 2014, and has been progressively introducing new production capacity. At the time of writing however, no announcements have been made or are understood to be imminent. to pay, Australia has long been a key export destination for the region’s tissue producers. Imports of tissue to Australia grew very strongly through most of the last decade. Look back ten years and imports totalled just 43,800 tonnes and accounted for a little less than one-fifth of Australian consumption. A decade on and 123,400 tonnes of imports had almost doubled their influence, accounting for close to 39% of total consumption. Across all time periods, two countries dominate, as Figure 4 shows. China is the dominant supplier, supported by an ever-growing presence from Indonesia. The other noticeable participant is New Zealand, not because of its volumes, but because these imports are from Asaleo Care’s New Zealand facility, back into the Australian market. In the most recent year, shipments from China accounted for 58% of the total, and those from Indonesia, for 30%. By any measure, combined, the two countries dominate imports to Australia. competition for their locally produced tissue than have little influence over it. That there is still some margin in this approach is evident by the expanding Australian converting operations of Asia. Melbourne convert APP’s tissue stock. Cottonsoft, their sibling in New Zealand operates the same model. In Australia, tissue producers are reliant on imported pulp for the significant majority of their fibre supplies. All of the local producers import pulp. As global pulp prices increased over the last year, local producers faced a still larger impost because the Australian dollar had depreciated against the US dollar. 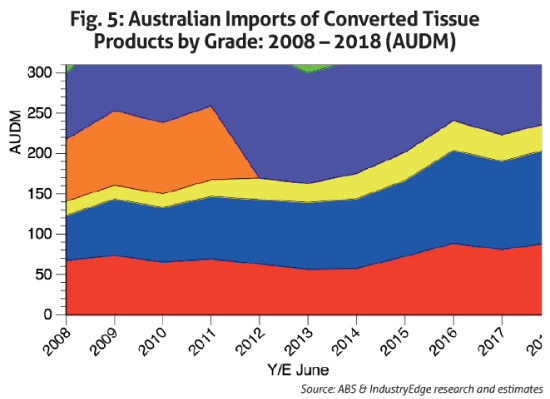 At the same time, the value of Australia’s imports of pre-converted tissue products was rising, in Australian dollar terms, primarily for the same reasons. Unfortunately, the pre-converted tissue import data is only available by value. same period. The implication is that with prices rising, import volumes have declined. 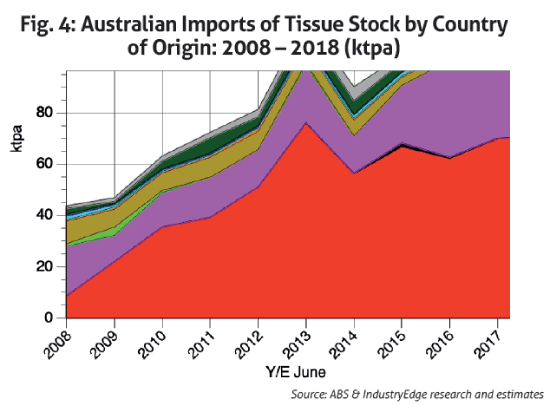 supply out, and pre-converted tissue product imports to Australia have barely grown over the decade. IndustryEdge forecasts further growth to 2023. The model deploys three trend scenarios, each of which shows strong growth over the next half decade, from a low of 3.8% per annum to as much as 6.9% per annum. The forecast based on the prior five years of consumption experience suggests consumption will rise an average 5.6% per annum. is the middle forecast is the most credible, assuming stable population growth and normal economic cycles. If it does eventuate, by 2023, Australia’s tissue consumption will be a little more than 420,000 tonnes per annum. The really interesting question is whether the additional consumption will be supplied locally, or by imports, or a mix of the two. If there is an additional role for domestic production, the next questions are the by who, where, when and how much questions. 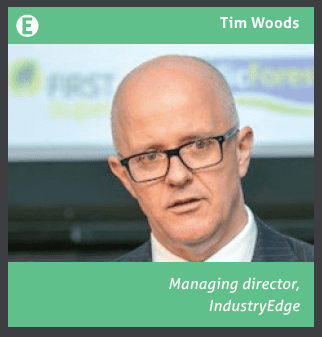 IndustryEdge is Australia’s and New Zealand’s paper and fibre market expert. Share the post "Fundamentals drive Australian and New Zealand tissue consumption higher"